This is to me the most exciting plant sale of the year. It’s nearly all edibiles, mostly organic, and you can just see people quivering with excitement about bringing home their plants and looking ahead to the delicious harvest. In past years, I have braved the mobs and gone early on the first day, the better to have a good selection, but I’m betting that this year will be a record-breaker in terms of attendance so I might go on Sunday instead and just take what’s left. They are supposed to bring in a new shipment of plants for that day, so I figure there’ll be at least something interesting as long as I don’t get my heart set on anything in particular. Will this be the year I finally break down and buy a stevia for sweetening my summer iced teas? Or try something really unusual like Persian Cress (similar to watercress but can grow in drier soil)? Or actually attend a demo put on by a Master Composter? For more info about the sale, including PDFs of what’s for sale, click here. Do you have an all-time-favorite can’t-miss plant sale that you move mountains to get to every year? Hi Karen! Sounds VERY interesting! Too far from me, unfortunately. But I plan to go to our local farmers market this Saturday, first time this year! Good luck to you! And the plant sales are off and running! Hope they all do well. I’ll be at the master gardener plant sale at UW CUH, but this one looks great too. Do tell if you get the stevia! I’m sure I’ll be tempted by the sweet siren call of many plants, but the main ones I’m looking for are the unique tomato plants. I’m drooling just thinking about their fruits…vegetables…whatever you want to call their produce ;). If you go early on Sunday, there should still be a pretty good selection. We will most likely be out of things like sungold tomatoes and other popular things, but there is always something good. (I’ll be there volunteering as a tomato seller from 12:30-3:30 on Sunday) Next year, volunteer a bit of time, and go to the volunteer sale (also tonight, before the pre-sale!) It’s fun! New line management, more cashiers, and more space for the plant tables this year – hopefully it will all run more smoothly and quickly than in years past. I’ve really got to start figuring out this thing about growing edibles. You can grow stevia and use it? I somehow thought you could only get it out of a jar from the store. I’m hopeless. Oh, I wanna go. Get some stevia for me, will ya? I just saw that a local stable is having an heirloom tomato plant sale next Saturday. I’d much rather have edible plants than flowers for Mother’s Day, wouldn’t you? Sounds like a dream day to me! I know of a few plant sales but not sure if San Fran has an Edible Plant Sale…I shall research! Did you make it? My friend from Florida emailed me the info on this! I don’t think I’ll make it tomorrow either unfortunately. If you go I hope you’ll show us what your found! 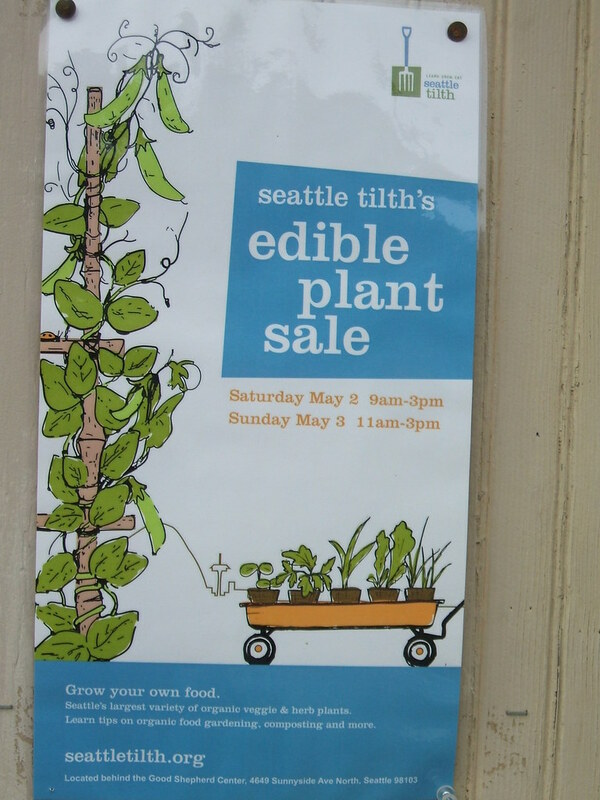 After having volunteered at the Tilth sale this morning I can safely assert that not even 4 hours of nearly constant pouring rain can dampened people’s enthusiasm for growing their own food! Yeah!!! P.S. Happy Birthday! Your plant sale sounded yummy! Hope you found some great plants. Yeah! for Vegetable gardens!!! Nothing like picking fresh food from your garden and going inside to prepare it! When you think of how old our food is by the time we get it, say when we buy greens that come from CA. or Fla. to Massachusetts… I love this time of year! Eating asparagus out of my garden now! I cannot always wait till I get inside to munch on them. Happy Belated Karen!